We're always expanding our foil options to meet your needs. These films can be utilized by many markets including Automotive, Point of Purchase, Marine and more. 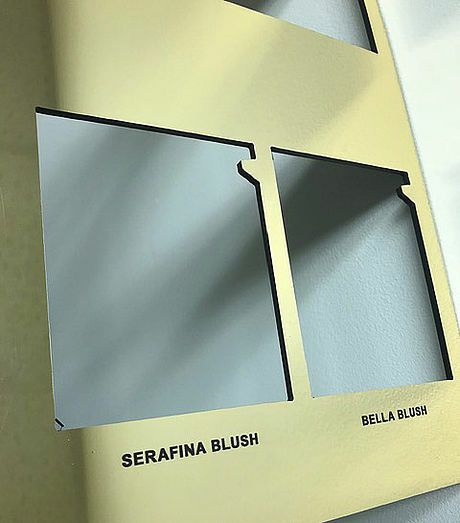 Bright Vac-Chrome (shown in image to right) - This metallic film is highly reflective and adds a level of sophistication to any retail display or marine part. 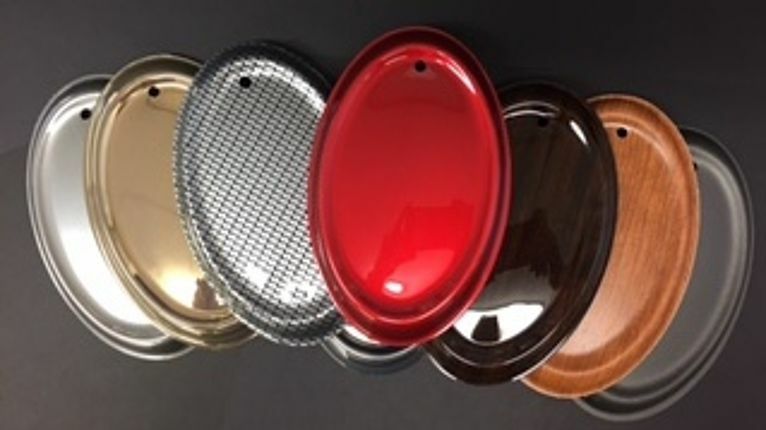 Electroplate Red - This metallic red tone would be perfect for holiday and seasonal point of purchase display. Metallic Blue - This metallic blue tone represents a futuristic blue, perfect to catch the eye of any consumer. Egyptian Gold - This soft gold reflects light and would provide a refined background for printing on plastic. Vegas Gold - This flashy gold lives up to it's name with a deeper color and sense of richness. Gun Metal Texture - This finish offers a slightly gritty texture, easily disguising fingerprints and smudges on plastic forming projects. Ebony Satin Chrome - This light gray finish provides a luster with a soft satin tone, ideal for thermoplastic laminate. Black Liquid Gloss - This finish portrays a look of "just been poured", still wet, deep black shiny finish, perfect for plastic forming. 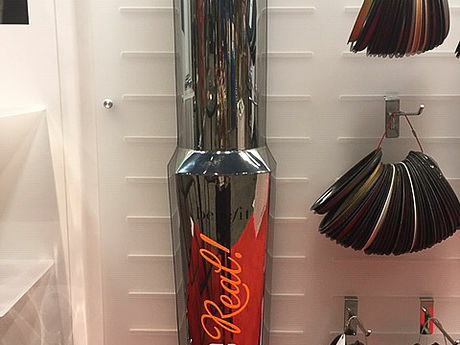 Red Chrome - This reflective metallic finish provides mirror like quality in a bright red, a perfect finish to create oversized holiday decorations & retail displays. Pacific Platinum - This silver speckled finish offers a neutral background with a slight sparkle, highly recommended for marine parts. Brushed Gun Metal - This dark gray brushed finish, is one of our favorite customized laminations, representing strength and masculinity. New Brushed Stainless - This updated classic contains the right amount of metallic shine with the brush of stainless, ideal for profile wrapping. Satin Black - This finish provides the brush of stainless with a rich black background, a twist on the classic. New Brush Stainless - This finish offers the brushed stainless look with a slightly warmer color. Stainless Steel - This brushed metallic film offers a the brush and appearance of stainless steel, with deeper gray background. Copperline - This sleek finish has a dark background that highights the copper horizonatal pattern. Black Metallic - This high tech finish would be the perfect material for a dashboard cover, with a black background and silver specks. If you do not see the finish you're looking for, contact us to help us understand what you're looking for.